The Clay Township Historical and Preservation Society is the proud owner of this stately museum in Greens Fork. The Museum is located in a Federal-style home on Indiana 38 on the corner of Pearl and Green Streets. The museum features items from Clay and other Wayne County Townships, photos, a genealogy library and more. Be sure to notice our post clock that stands outside the museum. 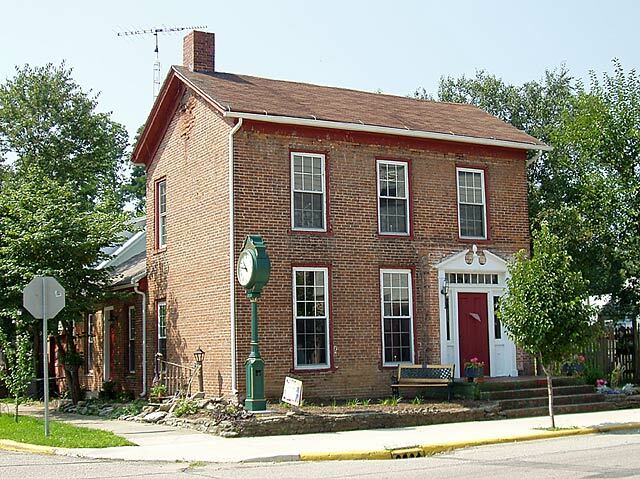 On October 22, 2002, the day before approval from the State Highway Department was received, the Historical Society was notified that the 1848 Federal Style Brick house was for sale. Approval was granted by the Society to purchase the house, as long as funding could be obtained. On January 30, 2003, the final papers are signed. The transaction from David and Susan Brockman is completed. The clock location will now be in front of the dwelling. Many people today refer to it as the "Winkle Home" or the "Maraba Bennett House" It was originally built by Stephen & Anna Elliott. Additional rooms, a garage, inside plumbing, and electricity over the years have been signs of change and progress. Until recent years, the original tract of land included the restaurant and the former bank building to the west of the house. 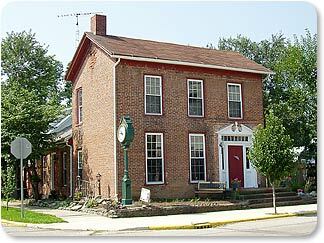 February 8, 2003, the first group of volunteers began to restore, refurbish and revive this home into a museum, genealogy center, and historical library for Clay Township. We planned a three-phase project. The house was re-wired and new plumbing installed. Three floors were sanded and refinished. Insulation and drywall was done. Two kitchen windows were replaced as well as new carpet in five rooms. We took out a full bath upstairs and installed a half bath downstairs. Two of three fireplaces were opened. New lights purchased and the front porch replaced with a Williamsburg pediment and columns. It required 40 gallons of paint to spruce up the house. Hopefully, our many basic decisions will make it easier for others in the future. A museum sign, window treatments, tuck-pointing the brick, and painting exterior windows was completed in 2007, after the major renovations were completed inside the building. The Memorial Garden with gazebo, iron fence, lighting, shrubs, planters, a fountain, and flowers was added in 2011. You will find elements in the garden that pertain to Clay Township history. There are monuments to honor War Veterans, 1936 Basketball Team, and a plaque dedicated to Greens Fork graduate Blanche Kerr who wrote a well known song titled, "Beyond the Sunset." There is corn planted in the garden along with signs that have the logos of the Seed Corn Dealers who had businesses in Clay Township, and a Maltese Cross honoring the local Fire Department. Additionally, a new "Grad Room" was also added at that time onto the back of the building and it houses composite class photos, trophies, 1936 Basketball Team items, memorabilia, blackboard from the school, painting depicting the various schools in Clay Township and modes of transportation used by students to get to school. Over 2,000 hours of work by volunteers (15 men, 17 women, and 2 children) has been done in five months. What a group! Oh yes, we even found $2.64 in the house and yard, a biscuit recipe in the wall, two knives, and a 1956 valentine. Please take time to see our "before" photos when you visit the museum. They will give you a better appreciation of our efforts. 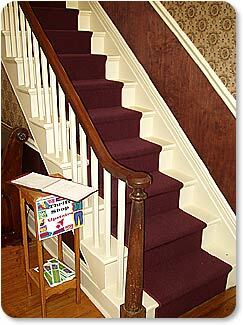 You'll be surprised at the native walnut stair banister (in 1848 people were shorter). Ask about the secret drawer. 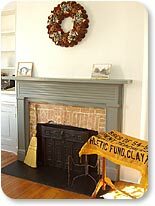 The house also features the original eight- to ten-inch plank flooring in the entryway with square nails. In 2009, Greens Fork High School graduates and former students were invited to be a part of the "Grad Room" project. It would be a way for them to "Pay It Forward" and leave a legacy of GHS memorabilia and history. The "Grad Room" and a Memorial Garden were dedicated on June 25, 2011. Upstairs, you'll find the area where we are opening a "Thrift Shop" to help meet our financial obligations. We would welcome good, clean clothing, toys, books, furniture, etc. If you have items for the museum - you may loan or donate them. Wayne County memorabilia as well as Clay Township articles are desired. To each of you who have given us gifts, made monetary contributions, or volunteered labor - we are deeply grateful. You have made this venture possible. 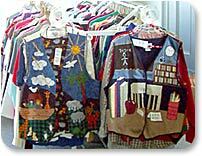 If you would like to assist us in the Thrift Shop, museum, or by volunteering your services, please let us know. Your monetary benefactions will allow us to meet our goals. Thank you for visiting our museum, library, and thrift shop. Jan. 12, 1904 - Maraba (Dean) Bennett sells a portion of Lot 15 to the First National Bank of Greens Fork. A Thrift Shop has been opened to help support the new museum. Shoppers and browsers are welcome, along with donations of clean, saleable goods. Special thanks to Jayne Beers of the Clay Township Historical and Preservation Society for providing this information.